My background is as an experienced field ecologist, specialising in habitat and botanical surveying, site condition monitoring and protected species survey. I currently work as a freelance consultant undertaking contract work for some of the leading ecological consultancies in Scotland. I have twenty years of professional work experience. I have extensive experience of vegetation and habitat surveying; especially National Vegetation Classification (NVC) surveys. I undertake vegetation surveys throughout Scotland, Wales and Northern England covering a diverse range of habitats from saltmarsh to montane communities and am a skilled field botanist with a good working knowledge of lower plants. I am also experienced with setting up and implementing large scale Site Condition Monitoring (SCM) & land management impact assessments on designated sites and onshore windfarms. Ecological constraints analysis for private development and engineering projects is another specialism where I can advise on licensing procedures and mitigation requirements for protected species and habitats. I currently hold a European Protected Species licence for great crested newts and act as Ecological Clerk of Works at ecologically sensitive sites and where protected species disturbance licences have been granted for developments. Recent projects include monitoring heathland and blanket bog recovery on former plantation sites through the use of NVC quadrats and tree regeneration counts. Herbivore impacts on the recovering vegetation were also assessed. I am a full member of the Chartered Institute of Ecology & Environmental Management (CIEEM) and am therefore bound by their code of professional conduct. I have a full clean driving licence and my own vehicle. Freelance ​Consultant Field Ecologist, 1999 – Present. Over eighteen years of successfully undertaking a variety of contract work for ecological consultancies throughout Scotland. A selected list of successfully completed contracts is to be found below. I sub-contract the work from consultancies and abide by their Health & Safety regulations. I spent two years working for the Scottish Wildlife Trust conducting Phase 1 Habitat surveys in Tweedale; surveying and assessing potential wildlife sites in the Scottish Borders and carrying out NVC surveys for Loch Lomond & Trossachs National Park. National Vegetation Classification (NVC) & Extended Phase I Habitat Survey. Identifying Annex I habitats and Annex II species occurring on sites and advising on practical solutions to avoid potential conflicts. NVC surveys can be undertaken using a relatively rapid ‘expert eye’ walkover technique or a more in depth survey with quadrat data which can be compared with the published community tables. I’m an experienced field botanist with excellent identification skills. Site Condition Monitoring & land management impact assessments. I can undertake Site Condition Monitoring following the JNCC Common Standards Monitoring guidance and land management impact assessments following MacDonald: A Guide to Upland Habitats. I have extensive experience of assessing the condition of upland habitats, especially heathland and blanket bog on designated sites and windfarm developments. Monitoring the condition of rare plant populations in the Scottish Highlands to assess climate change implications can also be undertaken. Surveys can be undertaken for the potential presence of protected species such as badger, water vole, otter, great crested newt and red squirrel. I currently hold an SNH animal conservation licence for great crested newts and have held many temporary protected species disturbance licences for otter, water vole and badger at development sites. Engineering projects and developments can be assessed for potential conflicts with current wildlife legislation through a combination of desktop analysis and targeted survey. Realistic mitigation and licencing requirements are outlined and implemented. I am proficient with ESRI ArcGIS applications including ArcGis 10.2, ArcPad and QGIS. I contribute to and advise on the Ecological Impact Assessment chapters of Environmental Impact Assessments for developments such as onshore windfarms. I also undertake breeding bird, moorland bird, wintering bird and vantage point counts for onshore windfarms and other developments. 2014 – Great Crested Newt eDNA surveys on Glen Isla golf course. Central Environmental Surveys for KDM architects. 2014 – Identification of GWDTE sensitive habitats on windfarm sites through NVC survey. FDM Ecology. 2014 – NVC survey and identification of UKBAP priority habitats on Forestry Commission land. Central Environmental Surveys for Forestry Commission Scotland. 2013 – Licensed Ecological Clerk of Works at various badger sett locations throughout Fife. Central Environmental Surveys for Scottish Power. 2013 – Heathland recovery, habitat condition and grazing impact surveys. Griffin Windfarm for Northern Ecological Services. 2013 – EcOW for Carillion Plc. working on the Edinburgh – Glasgow Improvement Project (EGIP) and Rutherglen to Coatbridge Electrification Project (RaCE). Principally involved in the protection of great crested newt populations. 2012 – Ecological constraints analysis of proposed power line upgrade work. Identifying and advising on potential conflicts with protected species and habitats. Central Environmental Surveys for Powerteam EU. 2011/2012 – Breeding bird, wintering bird and vantage point surveys at the proposed Kyllachy windfarm extension, Central Environmental Surveys. 2011 – Survey of vegetated shingle structures around the Scottish coast. Central Environmental Surveys for Southampton University. 2011 – ​Breeding bird, wintering bird and vantage point surveys at proposed Devol – Waterhead Moor powerline extension, Central Environmental Surveys. 2011 – Heathland recovery monitoring at Gordonbush Windfarm, Northern Ecological Services. 2011 – FES HAP Survey Framework – Glen Lochy. Identifying and mapping UKBAP habitats on land managed by FES. Central Environmental Surveys. 2011 – Phase 1 & NVC surveys at proposed Keillour & Soilzaire windfarm developments, Northern Ecological Services. 2011 – ​Great Crested Newt torching survey at proposed pipeline development, Carnoustie, Findlay Ecological Services. 2011 – ​Various dusk & dawn bat emergence surveys at small development sites for Auritus Wildlife Consultancy Ltd.
2011 – Vantage point bird counts at proposed windfarm developments in Fife & Tayside, Direct Ecology Ltd.
2011 – Phase 1 & NVC surveys at proposed Barcloy, Nathro Hill, Rosneath and Colsnaur Hill windfarm developments, FDM Ecology Ltd.
2010 – ​Otter & Water Vole survey, Kype Muir Windfarm, Direct Ecology Ltd.
2010 – ​Extended Phase 1 Habitat Survey, Tullo Windfarm, Direct Ecology Ltd.
2010 – ​Dusk & dawn bat emergence survey, Alloa Academy, Auritus Wildlife Consultancy Ltd.
2010 – ​Dusk & dawn bat emergence survey, Alva Academy, Auritus Wildlife Consultancy Ltd.
2010 – FES HAP Survey Framework – Carrick Farm. Identifying and mapping UKBAP habitats on land managed by FES. Central Environmental Surveys. 2010 – ​Internal bat inspection and dusk/dawn bat emergence survey, New Park School, St. Andrews for Direct Ecology Ltd.
2010 – ​Breeding bird survey for proposed Erskine – Devol powerline. Central Environmental Surveys for Scottish Power. 2010 -​Habitat Impact Assessment and Site Condition Monitoring at proposed Gordonbush windfarm. Northern Ecological Services for Scottish & Southern Energy. 2010 -​Pre-construction ecological screening survey at Beauly Viaduct. Central Environmental Surveys for WYG Engineering Ltd.
2010 -​Otter mitigation statement for potential development site at Glen Isla, Alyth. Central Environmental Surveys for KDM architects. 2010 – Aerial photograph interpretation and digital habitat mapping using ESRI ArcView at the proposed Fairburn windfarm site. Northern Ecological Services for Scottish & Southern Energy. 2009 – Dawn & dusk bat emergence surveys at sites in Clydebank & Methil for Auritus Wildlife Consultancy Ltd.
2009 – ​Dawn & dusk bat emergence surveys at Stracathro & Murray Royal Hospitals for Direct Ecology Ltd.
2009 – ​Phase 1 habitat survey of proposed access track to Gordonbush Windfarm. Northern Ecological Services for Scottish & Southern Energy. 2009 – ​Aerial photo interpretation & Phase 1 digital mapping exercise using ESRI ArcView for proposed Gordonbush windfarm. Northern Ecological Services for Scottish & Southern Energy. 2009 – ​Phase 1 & Protected Species survey at proposed development site at Ardbeck Hill, Peterculter. Central Environmental Surveys for Bancon. 2009 – ​Phase 1 & Protected Species survey at a proposed development site at Westerwood, Cumbernauld. Central Environmental Surveys for Jones Lang LaSalle. 2009 – ​Protected mammal surveys along proposed Erskine – Devol powerline. Central Environmental Surveys for Scottish Power. 2009 – ​Extended Phase 1 & Protected Species survey at a potential development site at Glen Isla, Alyth, Central Environmental Surveys for KDM architects. 2009 – ​Site Condition Monitoring of Rare Vascular Plants Ben Alder, Ben Heasgarnich, Ben More & Stob Binnein SSSI’s. Central Environmental Surveys for Scottish Natural Heritage. 2009 – ​Extended Phase 1 & protected species survey on railway cuttings at Aberdour, Fife. Stuart Spray Wildlife Consultancy. 2009 – ​Badger, otter and water vole survey at two disused railway bridges in Fife. Central Environmental Surveys for Carillion Plc. 2009 – ​National Vegetation Classification survey and European protected plant survey at proposed Harrow’s Law Windfarm. Northern Ecological Services. 2009 – ​Upland Site Condition Monitoring: Bullburn Plantation, Gordonbush Windfarm. Northern Ecological Services for Scottish & Southern Energy. 2008 – ​Tree survey for potential bat roosts at a development site, Torrance, East Dunbartonshire. Central Environmental Surveys for MRK Developers. 2008 – ​Otter & Water Vole survey at Loch Fitty, Fife. Findlay Ecological Services. 2008 – ​Bat roost and dusk/dawn activity surveys at the derelict Birkwood Hospital complex, South Lanarkshire. Part of a large team undertaking bat surveys over several days. 2008 – ​Wetland Site Condition Monitoring. Carried out SCM at four wetland SSSI’s. Central Environmental Surveys for Scottish Natural Heritage. 2008 – ​Phase 1 habitat survey & protected species survey for proposed development at Torrance Park, Lanarkshire. Central Environmental Surveys for New Brannock ltd.
2008 – ​Phase 1 habitat survey & protected species survey at proposed development site, Coalburn, South Lanarkshire. Central Environmental Surveys for Commodore Homes Ltd.
2008 – ​Bat roost survey, dawn activity survey & squirrel survey at proposed Sainsburys development, Haddington, East Lothian. Heritage Environmental Ltd.
2008 – ​Habitat survey, bat roost survey & red squirrel survey, Cupar Muir, Fife. Central Environmental Surveys for Montgomery Forgan Associates. 2008 – ​Ground verification exercise of existing vegetation survey at Harrow’s Law windfarm site, South Lanarkshire. Northern Ecological Services for DP Energy. 2008 – ​Otter, badger & water vole survey of proposed opencast site at Earlseat, Fife. Northern Ecological Services. 2008 – ​Breeding bird survey of proposed opencast site at Earlseat, Fife. Northern Ecological Services. 2008 – ​Otter & Water Vole survey, Protected species licence application & method statement at Kinclair Viaduct, South Aryshire. Central Environmental Surveys for Carillion PLC. 2008 – ​Protected species survey at Edgar Allen Foundry, Bathgate, West Lothian. Central Environmental Surveys for ArcTech Design Associates Ltd.
2008 – ​Otter and Water Vole survey at Russell Mill, Springfield, Fife. Central Environmental Surveys for Bracewell Stirling Architects. 2008 – ​Breeding bird survey of proposed opencast site at Wellsgreen, East Wemyss, Fife. Northern Ecological Services. 2008 – ​Ecological survey and environmental constraints analysis including breeding bird survey of two proposed windfarm site in NE England. Central Environmental Surveys for Greenpower. 2008 -​ Plantations on Ancient Woodland Sites (PAWS) survey of selected sites in Argyll. Central Environmental Surveys for the Forestry Commission Scotland. 2008 – ​Ecological survey and environmental constraints analysis of proposed housing development, Standhill, Armadale. Central Environmental Surveys for EMA Architecture+Design Limited. 2008 – ​Environmental Constraints analysis at various power line works for Scottish Power Systems. Central Environmental Surveys for Scottish Power Systems. 2008 – ​Environmental Constraints analysis at various railway engineering projects for Carillion PLC. Central Environmental Surveys for Carillion PLC. 2008 – ​Extended Phase 1 & NVC survey of proposed windfarm development at Cowans Law, Ayrshire. Central Environmental Surveys for Community Windpower Ltd.
2008 – ​Phase 1 & European Protected Species survey along revised underground power cable route: Lunanhead – Forestmuir. Northern Ecological Services for Scottish & Southern Energy. 2008 – ​NVC vegetation survey of selected sites, Ayrshire. Central Environmental Surveys for Scottish Coal. 2007 – ​Extended Phase 1 habitat survey and European Protected Species survey for proposed newbuild power line at Coalburn Moss SSSI/SAC. Central Environmental Surveys for Scottish Power, Power Systems. 2007 – ​Extended Phase 1 vegetation survey of potential new ‘Sites of Importance for Nature Conservation’ (SINC). Central Environmental Surveys for West Dunbartonshire Council. 2007 – NVC survey of proposed extension of Bowbeat Windfarm, Scottish Borders. Northern Ecological Services for Natural Power. 2007 – ​European Protected Species survey of selected track works. Central Environmental Surveys for Carillion PLC. 2007 – Open Space Habitat Action Plan survey. Central Environmental Surveys for the Forestry Commission. 2007 – Phase 1 & European Protected Species survey along proposed underground power cable: Lunanhead – Forestmuir. Northern Ecological Services for Scottish & Southern Energy. 2007 – ​Phase 1 & European Protected Species survey for power line refurbishment: Tealing – Lunanhead. Northern Ecological Services for Scottish & Southern Energy. 2007 – ​Upland Site Condition Monitoring: Langholm – Newcastleton Hills. Central Environmental Surveys for Scottish Natural Heritage. 2007 – ​European Protected Species Survey: Ury Estate, Stonehaven. Central Environmental Surveys for the HFM Partnership. 2007 – ​Breeding bird survey, winter bird survey, and vantage point watches for proposed windfarm sites in Aberdeenshire. Central Environmental Surveys for Natural Power. 2007 – ​An ecological assessment of the planned extension to North Gailes Country Club golf course with management & mitigation advice. Central Environmental Surveys for North Gailes Country Club. 2006-7 – NVC survey and aerial photo interpretation in Glen Affric. Central Environmental Surveys for Forest Research. 2006 – ​Saltmarsh Condition Monitoring. Central Environmental Surveys for CCW. This was an extensive survey of all the major areas of saltmarsh around the Welsh coast. 2006 – ​Extended Phase 1 habitat survey with management recommendations for Cardrona, Peebles and Auchterarder Golf Clubs. Central Environmental Surveys for Scottish Golf & Environment Group. 2006 – Breeding bird survey of Loch Katrine. Central Environmental Surveys for the Forestry Commission. 2006 – ​Breeding bird survey, Carie Woods, Loch Rannoch. Central Environmental Surveys for Scottish Hydro Electric. 2006 – ​A protected species survey of proposed power line work at Criagluscar water works. Central Environmental Surveys for PowerSystems. 2006 – ​Species Digitisation: Converting old records to SNH’s new data capture tool program. Central Environmental Surveys for Scottish Natural Heritage. 2006 – ​Habitat survey of the non open-water parts of Loch Ussie Special Area of Conservation. Northern Ecological Services for Scottish Natural Heritage. 2006 – ​Habitat survey of the non open-water parts of Loch Ruthven Special Area of Conservation. Northern Ecological Services for Scottish Natural Heritage. 2005 – Clara Vale Pond/Westfield Pasture SNCI NVC survey. Central Environmental Surveys for English Nature. 2005 – Brenkley Meadows SSSI NVC survey. Central Environmental Surveys for English Nature. 2005 – Garrison Farm Proposed Woodland Expansion: Environmental Statement. Central Environmental Surveys for Scottish Woodlands. 2005 – ​Assessment of ponds at the Perthshire Offroad Driving Centre regarding suitability for Great Crested Newts (Triturus cristatus) Central Environmental Surveys for Perthshire Offroad Driving Centre. 2005 – ​Assessment of Sensitive areas in Relation to Burning Regimes within selected SSSI’s within the Yorkshire Dales National Park. Central Environmental Surveys for English Nature. 2005 – ​Assessment of Sensitive areas in Relation to Burning Regimes within selected SSSI’s within the North York Moors National Park. Central Environmental Surveys for English Nature. 2005 – Condition assessment of ‘European dry heath’, ‘Northern Atlantic wet heath with Erica tetralix’ and ‘blanket bog’ and Rhynchosporion habitats within the Preseli Special Area of Conservation. Central Environmental Surveys for Countryside Council for Wales. 2005 – NVC Survey of Ben Lomond SSSI. Central Environmental Surveys for The National Trust for Scotland. 2005 – Phase I Vegetation survey of proposed wind farm site: Leapmoor Forest. Central Environmental Surveys for Community Windpower Ltd.
2005 – Phase I Vegetation survey of proposed wind farm site: Wardlaw Wood. Central Environmental Surveys for Community Windpower Ltd.
2005 – Condition assessment of ‘European dry heath’, ‘Northern Atlantic wet heath with Erica tetralix’ and ‘blanket bog’ habitats at the Migneint-Arenig-Dduallt Special Area of Conservation (SAC). Central Environmental Surveys for Countryside Council for Wales. 2004 – ​North Glen Affric Vegetation Condition Monitoring. Central Environmental Surveys for Scottish Natural Heritage. 2004 – NVC Survey of Great Crested Newt Habitat and GPS Pond Location within the Pitmedden Forest Cluster, Fife. Central Environmental Surveys for Scottish Natural Heritage. 2004 – NVC surveys of selected SSSI’s in Grampian. Central Environmental Surveys for Scottish Natural Heritage. 2004-2005 – CSM Vegetation Condition/Monitoring North Pennines. Central Environmental Surveys for English Nature. 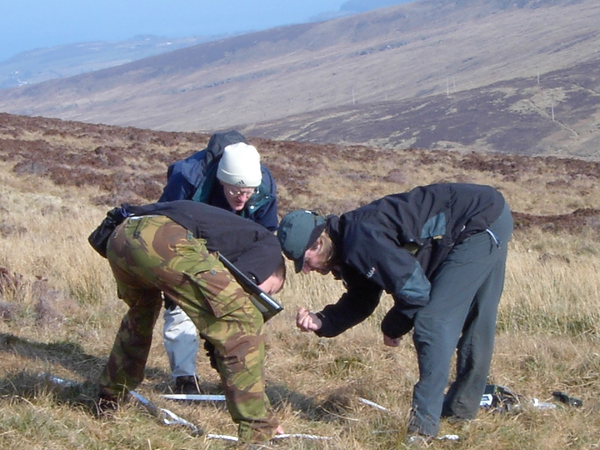 2004 – Vegetation Condition Assessment and Monitoring within the Berwyn Mountains SSSI. Central Environmental Surveys for Countryside Council for Wales. 2003 – Eden Estuary SSSI NVC survey. Central Environmental Surveys for Scottish Natural Heritage. 2003 – Tayport – Tentsmuir Coast SSSI NVC survey. Central Environmental Surveys for Scottish Natural Heritage. 2003 – NVC survey of selected features on Ben Lawers and Ptarmachan Ridge SSSI. Central Environmental Surveys for Scottish Natural Heritage. 2003 – NVC survey of selected areas within the Brecon Beacons National Park. Central Environmental Surveys for Countryside Council for Wales. 2002 – Eryri (Snowdonia) Environmnetal Change Network (ECN) Monitoring. Central Environmental Surveys for Countryside Council for Wales. 2002 – Habitat Survey of Inner Tay Estuary. Central Environmental Surveys for Scottish Natural Heritage. 2002 – NVC Survey of Arran Moors PSPA/Arran Northern Mountains SSSI& North Arran Habitat Condition Assessment. Central Environmental Surveys for Scottish Natural Heritage. 2002 – NVC Survey of the Mynydd Llangynidr/Llangatwg SSSI’s within the Brecon Beacons National Park. Central Environmental Surveys for Countryside Council for Wales. 2002 – NVC Survey of the North Pennines. Central Environmental Surveys for English Nature. 2002 – NVC survey of the Rinns of Islay SSSI. Central Environmental Surveys for Scottish Natural Heritage. 2001 – NVC Survey of Southern Catchment of Loch Katrine. Central Environmental Surveys for Scottish Natural Heritage. 2001 – NVC survey of Eryri (Snowdonia). Central Environmental Surveys for Countryside Council for Wales. 2000-2001 – NVC Survey of selected SSSI’s in Fife. Central Environmental Surveys for Scottish Natural Heritage. 1999 – Vegetation Survey of Loch Lomond & Trossachs Area. RASD Commissioned Research Report for Central Environmental Surveys for Scottish Natural Heritage. 1999 – Survey of Corncrake habitat within selected SSSI’s in the Western Isles. Central Environmental Surveys for Scottish Natural Heritage.